Open your book of choice by clicking on its title in your results list. 2. 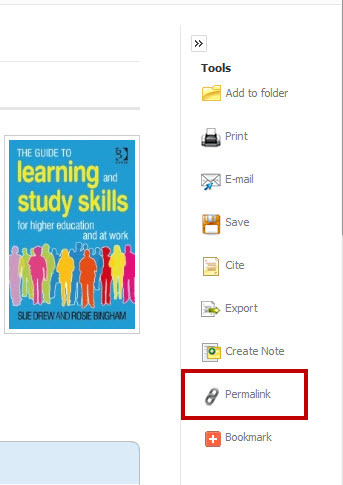 On the Detailed Record page, click 'Permalink' located on the right side of the page in the Tools section. 3. Move your mouse into the Permalink box that will apear near the top of the page. 4. Hit the, Ctrl and C keys simultaneously to copy the persistent URL for this EBSCO ebook. 5. Log in to BlackBoard and select the course in which you wish to place the link. 6. Once you have navigated to the location/folder to which you want to place the link, you will use the Build Content drop down menu to select, Web Link. 7. Place your cursor in the URL box and hit, Ctrl and V keys simultaneously to paste the persistent URL. 8. Fill out other fields as appropriate. Hit Submit. 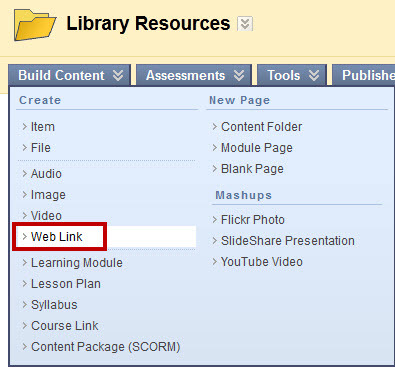 Your chosen EBSCO ebook should now be listed(and linked) in your course content for students to view.